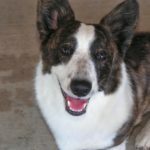 Guest Post by Vicki Combs of Arizona Cactus Corgi Rescue. 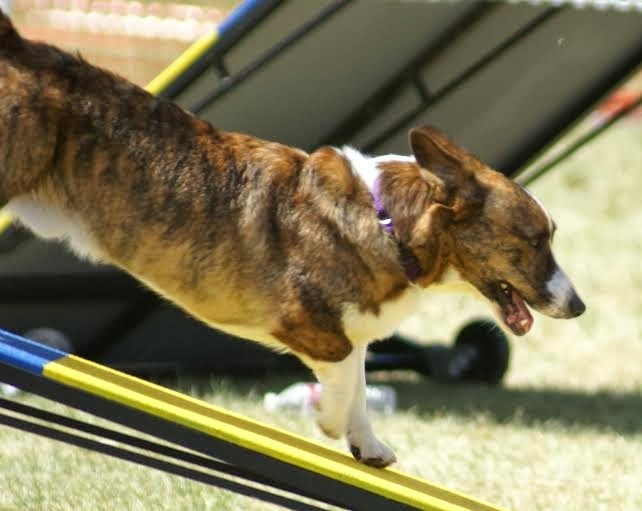 This is the story of how Arizona Cactus Corgi Rescue (AZCCR) made the local TV news in Phoenix. 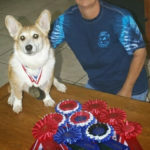 Thanks to Cardigan Welsh Corgi Coco Posh’s win as Best of Herding Group this year at Westminster, the buzz about Corgis is louder than ever. 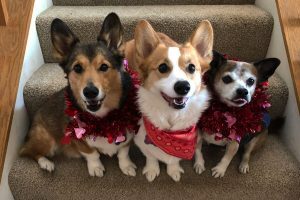 The upshot of that historic win for AZCCR was an invitation last week from the local Fox News affiliate to visit the station with Corgis in tow and expert knowledge of the breeds. The big call came on short notice. “Short” as in the night before. The FOX producer asked whether we’d be available for a live interview the following morning (Wednesday the 12th). The shy person inside of me cried WHAT?! No way. LIVE TV? No way. The un-shy side of me (phew) jumped on this prime opportunity to get the word out about Corgis and rescue. YEAH! Let’s DO IT! 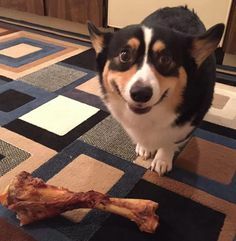 The dogs deserve it! 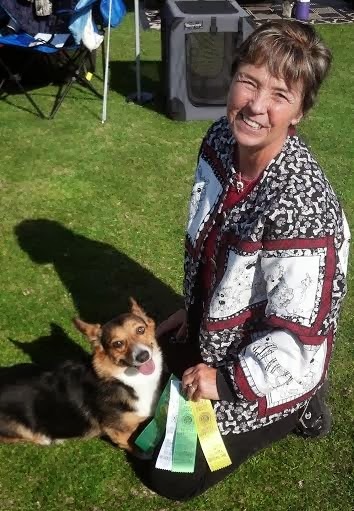 ACCR Medical Director Diane Paster, who owns both Pembroke and Cardigan Welsh Corgis was easily lassoed into joining me for our televised adventure. “Let’s DO IT!” she said. And so we did. We DID IT! The producers OK’d our on-air wardrobe (green AZCCR t-shirts) in advance. Convenient, as our only other wardrobe choices were scrub shirts. The night before the big day turned into a scramble of activity: dog bathing, working on our schpiel for live TV, figuring out how to calm jittery nerves. 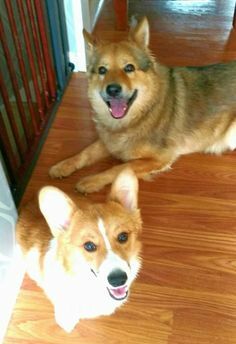 Ours, not the Corgis. They’re just natural attention getters! 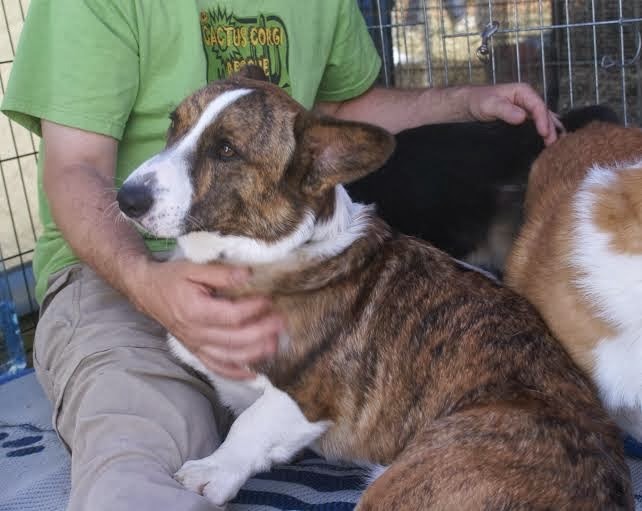 Diane planned to bring Cardigans Bumble (one of our rescue alumnae) and Darwin, a handsome red brindle Cardi. I would take Diamond Girl, another AZCCR rescue, to repesent the Pems. The next morning, one of us made it to the station on time for our 7:15 prep session with plenty of time to spare. The other (me) rolled in with five minutes left to live-on-air, after getting a bit lost on the drive and caught up in traffic. Diamond and I were whisked by security into the building, where Diane was about ready to do the interview without us. Never fear, Diamond Girl was there! Luck was ours, with her by my side. A hasty introduction to the news anchor and away we went. As you can see in this video of our TV segment, Diamond stole the show. She was a bit shy and took cover behind my legs, peeking out when the camera came close. 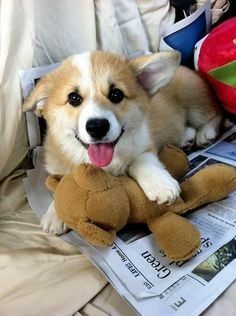 Cute enough to win many, many hearts. 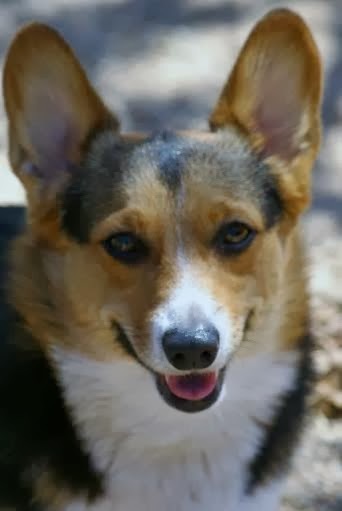 During the interview, I made clear the difference between the two breeds of Corgi and plugged our rescue. 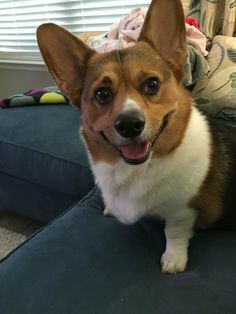 As a Corgi lover and advocate, I am VERY happy for Coco’s win! As a rescuer, though, I am very worried about Coco’s win, as many are. Why? 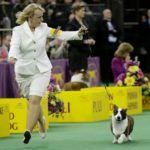 As a rescuer, we know that the “winning” breeds of any group and the Best in Show at Westinster become VERY popular that year. Which is great for the breed, as long as the popularity is managed and the breeding is kept with reputable breeders. However, as rescuers, we know that many backyard breeders and puppy mills are in it for the money and will abuse the breed, overbreed, and not be concerned where their dogs end up. 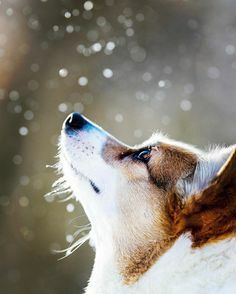 Corgis are very appealing, with their liveliness, intelligence and beauty. 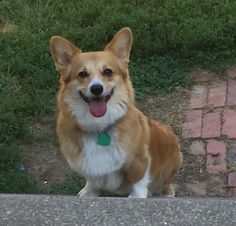 While they are appearing more and more in media of all kinds, the truth is that not every household is the right fit for a Corgi. Cardi or Pemmie. So where do they end up, if things don’t work out? With a rescue, or if they’re less fortunate, in a shelter, thrown out in the street, etc. 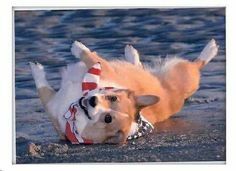 I hope our brief spot on TV helps people to understand that a Corgi, while very sweet and cute, isn’t always the right fit. 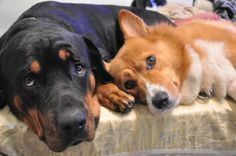 If it is, it’s important to look to rescue first, not pet stores or puppy mills, where the dogs are often not looked after (or worse), their welfare sacrified to profit over much else. With our 15 minutes of fame behind us, we’ve had many inquiries. We network to other rescues if the inquiries are from out of state. Most of all, we hope we helped the breeds. 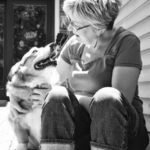 At the end of the day, the safety of the dogs and integrity of the breed remain vitally important, regardless of popularity. 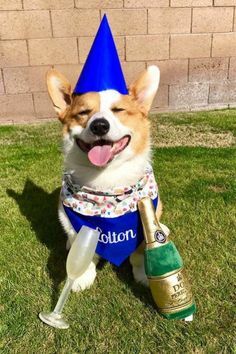 As a fan of Corgis, you can do your part to educate others. Share what you know, where and when you can; education can be a powerful preventitive. P.S. – Our rescue T-shirts are available for purchase for $15 plus shipping and they are awesome! Darwin’s Dad is sporting one in this photo. Want one of your own? 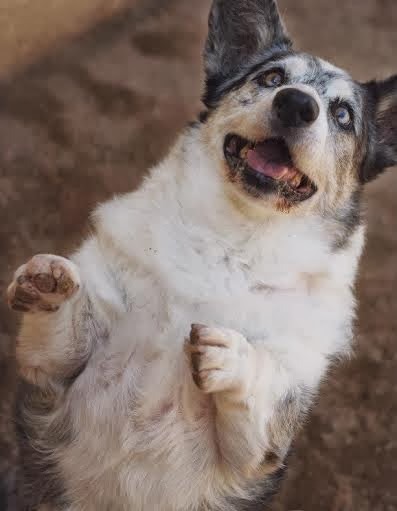 Drop me a line: vicki@azcactuscorgirescue.com.